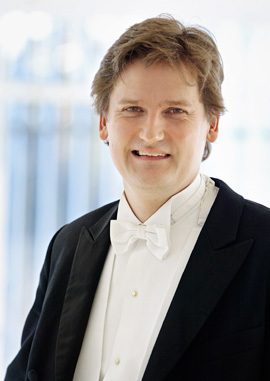 Finnish pianist Olli Mustonen took his audience on something of a rollercoaster performance in this concert, with a programme that began a bit roughly, but luckily, ended on a high note. The recital began with Schumann's Kinderszenen, which, unfortunately, suffered under Mustonen's extreme heaviness of touch and overuse of the sustaining pedal, particularly in the vibrant scenes, 'Wichtige Begebenheit' and 'Ritter vom Stechhkenpferd', which as a result became muddled in their story-telling. In fact, there appeared to be too much reliance on both pedals, as Mustonen struggled to find the appropriate Romantic sentiment for the Schumann. Unfortunately as a result, the work lost its warmth and clarity of feeling. As the programme continued, Mustonen grew more comfortable. Scriabin's Sonata No. 10 and the short work Vers la flamme, showcased the pianist's confidence with the Modernists. Both works are characterised by their strong use of trills and tremolos. Mustonen seemed at ease with Sonata No. 10's chromatic atonality. In Vers la flamme, he emphasised the unique harmonies and impressive tremolos, leading to an energetic climax that continued to build relentlessly until the very end. The Shchedrin Prelude and Fugues allowed Mustonen to find a lighter touch and a clarity, which had been missing earlier in the programme. He performed each Prelude and Fugue with a great understanding of the rhythmic textures at play. However, it was the Martinu that was most successful. With virtuosic, light fingers, Mustonen grasped the character of the work well. The jazzy, Gershwin-like passages were fluidly juxtaposed against the opulent shifts in countrapuntal harmonies. Overall, Mustonen has a tendency to heavy-handedness, frequently relying on the soft pedal in gentle passages. His rather showy gesticulations and constant fluttering of his fingers in the air sometimes border on visual distraction, and it is uncertain whether the excessive hand movements benefit the sound. However, despite the rocky start to the recital, Mustonen found comfort in the Modernists, and ultimately managed to redeem himself confidently.